Mattie McQueen is desperately poor. So were her parents, her grandparents and her great-grandparents. So are her children and her young grandchildren. Is there a way out? OTIS BULLOCK JR. was in the second grade at Meade Elementary School in North Philadelphia when a teacher asked him to write an essay on what he would like to be when he grew up. Today, Bullock holds a Temple law degree and has already established himself, at 38, as a low-key star in Philadelphia’s political and social firmament. He worked for City Councilwoman Jannie Blackwell and later for Mayor Michael Nutter. 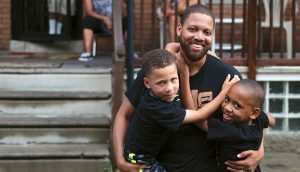 His wife, Donna Bullock, just 37, is already a state representative for parts of North and West Philadelphia, including impoverished neighborhoods like Mantua and Strawberry Mansion. Currently, Otis Bullock Jr. serves as executive director of Diversified Community Services, a nonprofit dedicated to helping the city’s low-income families that he’s positioned at the cutting edge of the war on poverty. Educating children without stabilizing the home, says Landry, puts kids in an impossible position — requiring them to lead their parents. Making a child’s home safer and less stressful yields huge benefits in the child’s ability to learn. And two-gen strategies are gaining support among conservatives and progressives alike. Republican governors like Bill Haslam of Tennessee and Gary Herbert of Utah champion the two-gen approach for imparting a sense of responsibility to parents and streamlining government — parking disparate social agencies under one roof. Paul Ryan, Republican Speaker of the House, recently told NPR that helping children requires helping their families — a truism of two-gen thinking. And at July’s Democratic convention here in Philadelphia, former president Bill Clinton extolled the virtues of HIPPY (Home Instruction for Parents of Preschool Youngsters) — a seminal two-gen program that Otis Bullock Jr. brought to Diversified.